The commander slams full power to the shields while the pilot evades enemy fire and the engineer works to bring the engines back online and vents the cargo hold to kill the raging fires before they spread to the oxygen plant: This is the tightrope walked by some of our greatest sci-fi heroes from Han Solo to Mal Reynolds. FTL brings that drama to life in the framework of a single ship’s desperate flight through randomly generated sectors to warn the Empire of a coming Rebel attack. The tiny indie studio at Subset Games expertly joins RPG progression mechanics, simple text-adventure dilemmas, multi-faceted one-on-one starship combat, and the ironman challenge of a roguelike in FTL. Jumping from system to system, players gather scrap from lucky salvage jobs, help non-hostile crews and planets, and engage in combat. The all-important scrap is then used to improve the ship or trade for necessities like fuel and missiles, new weapons, and hiring additional crewmembers. The overwhelmingly powerful rebel pursuit is only ever a few jumps behind, and every sector brings stronger enemies. Basic survival isn’t enough; you must grow stronger if you have any hopes of reaching the final sector and defeating the rebel flagship. 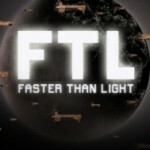 FTL’s gameplay loop is simple, but wonderfully executed. Taking out each enemy ship, whether you board it and kill the crew, cluster laser blasts to punch through its shields, or bombard it with bombs and missiles, is invariably satisfying to pull off. A dearth of encounter types makes figuring out the optimal tactic for a given battle trivial after a few hours, but the huge effect that FTL’s randomization has on your capabilities at least means you’re not always doing the same thing over and over. “Losing is fun” is a goal that any game with permadeath must strive for (and many fail to achieve), but every death is just an excuse to try out new weapon and system combos. A full run through of the game is only an hour or two long, so it’s not like you’re losing hours of progress. Unlocking the rest of the ship roster should be easier, since trying different ships is a core pillar of FTL’s replayability. The ill-conceived boss fight breaks the established rules to deliver a frustratingly unfair challenge, but the meat of the gameplay itself is an excellent take on one of sci-fi fandom’s oldest and most beloved themes. You have to respect that accomplishment when it comes from anyone, much less a two-man studio Kickstarted into a $10 indie game. The drama of keeping a flying bucket of bolts together long enough to jump away from pursuit is brought to life in slick hour-long chunks.